Servers should be mature enough to understand their responsibilities and carry them out well and with appropriate reverence. 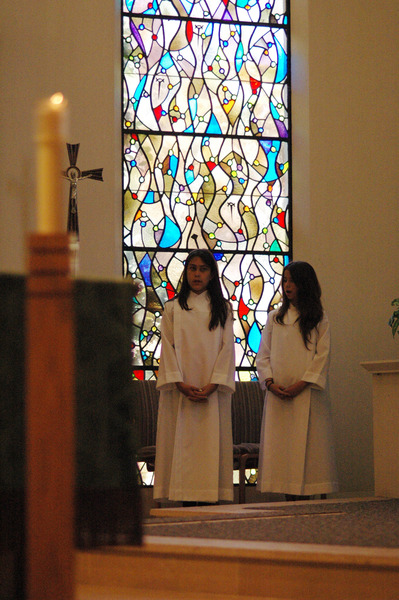 Parental/Guardian approval of participation is required for the Altar Server Ministry. Servers carry the cross, the incense and censer, present the bread, wine and water to the priest during the preparation of the gifts or assist him when he receives the gifts from the people, wash the hands of the priest, and assist the priest celebrant as necessary. Monthly schedules will be e-mailed to servers. As an Altar Server you are a very important part of the Mass. The priest and the congregation rely on your presence. Therefore, you must be committed to serving when you are scheduled. If you have a scheduling conflict, you must inform the Coordinator and attempt to arrange for another Altar Server to serve in your place. Copies of the Altar Server roster with phone numbers and e-mails will be made available by the Coordinator upon request. Dress and wear your hair neatly. Wear clean shoes, pants and a light colored shirt that will not show through the white alb. Arrive 10 to 15 minutes prior to Mass and sign in. Choose an alb from the sacristy that fits. An alb of proper length should brush the tops of your shoes, but not be so long that you could trip. Make sure the cincture you choose is the correct Liturgical color and tied properly—not too tight, not too loose. As you process into church, fold your hands in front of you in respect. If you carry the cross, hold it so the cross is raised slightly above your head, and carry it reverently. During Mass all Altar Servers stand, sit and move in unison. Remember you are very visible at Mass—so please be a wonderful witness for the congregation! Be prayerful: participate in the prayers, responses and song. Be attentive, sit up straight and participate during Mass. After Mass, process out reverently. After Mass, hang your alb neatly in the sacristy on the hanger which properly identifies its size, and don’t forget to hang up the cincture as well. "You will be little apostles who obtain the graces of the Lord for so many souls, and prepare for yourselves a great and precious treasure in heaven."